Have your ever wished you could have your name be a permanent and visible part of the College of Business Administration Building Complex, but thought the possibility was out of reach? Now there is an opportunity to leave a lasting legacy for future generations of business leaders. The CBA Building Complex has had a profound effect on our students, faculty and staff, and our corporate partners. It's the place to showcase the many achievements of our alumni. It's the place are community calls home. 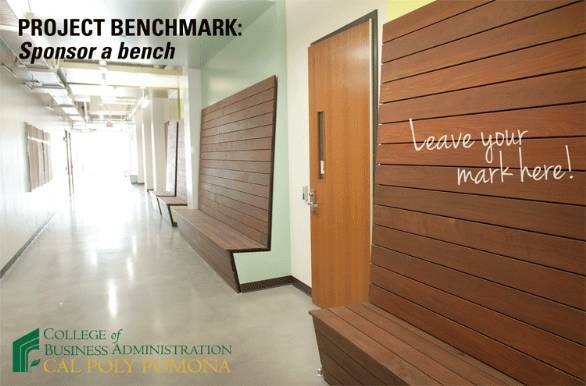 Leave your mark today by honoring your own legacy, the memory of a loved one or friend, or a favorite faculty member by sponsoring a bench today! A plaque will be installed on each bench recognizing your tax deductible contribution. Limited opportunities are available at each level. Make a gift now by contacting Jeff Cox at (909)869-2755.